TEHRAN, Feb. 7 (Mehr News Agency) -- A $500 million contract on 'Iran LNG', a project to produce liquefied natural gas (LNG) from the South Pars (SP) phase 12, southern Iran, was signed here on Wednesday at the building of Iran's Oil Ministry. 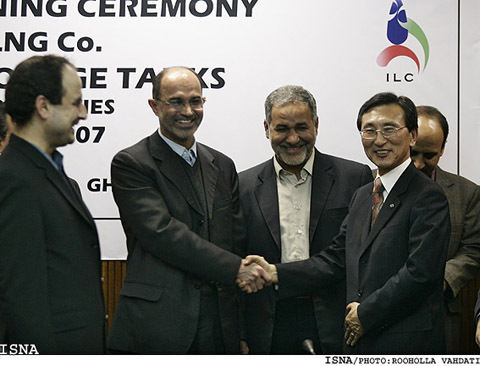 The contract was inked by Iran's Khatam-ol-Anbia Construction Headquarters (KOA) - an engineering arm of the Islamic Republic Guards Corps (IRGC) - and Korea's Dilam. Iran LNG is to produce 10 million tons of LNG per annum plus 700,000 tons of liquefied petroleum gas (LPG) and 300,000 tons of condensates per year. The project constitutes of three packages namely sweetening and liquefying operations, the construction of LNG and LPG storage tanks, and the construction of port and dock facilities, Iran LNG Manager Ali Kheir-Andish elaborated, according to the Mehr News Agency. The Wednesday contract was signed on the second and third packages, respectively the construction of LNG and LPG storage tanks, and the construction of port and dock facilities, he added. Kheir-Andish further said that talks are being held with contractors on the implementation of the first package of the project, the sweetening and liquefying operations. Moreover, negotiations are currently underway with four international companies on the management of the project. Kheir-Andish stated that the basic designing of the project has been carried out by a consortium of French and Japanese companies under the supervision of the National Iranian Gas Company (NIGC), a subsidiary of the National Iranian Oil Company (NIOC). Akbar Torkan, the managing director of the Pars Oil and Gas Company (POGC) on 2 February told the Iranian Students News Agency (ISNA) that the POGC and the Petropars - two NIOC subsidiaries - are the contractor and sub-contractor of the upstream part of the Iran LNG respectively. He added that the downstream work of the project will be implemented by the NIGC. 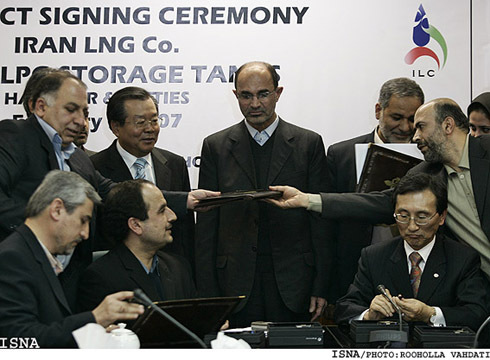 Kheir-Andish further stated that the Iran LNG Project is scheduled to come on stream in 2010. Also ISNA reported Kheir-Andish as saying that the NIOC holds 49 percent of the shares in the Iran LNG Project, with the rest shared by the Oil Industry Investment Company (OIIC) and Oil Industry Pension Fund. The shares of the two later is planned to reduce to 11 percent, and then the remained 40 percent will be granted to purchasers and investors in the project. Iran is pursuing two more projects to produce LNG from the South Pars phases, which are termed Persian LNG and Pars LNG. On the Persian LNG, Iran signed a preliminary deal worth $4.3 billion with Anglo-Dutch Shell and Spain's Repsol. The final investment decision (FID) of the project is valued at $10 billion, which will produce LNG from phases 13 and 14. Moreover, the POGC Managing Director on 2 February told ISNA that a FID on the Pars LNG Project will be made by mid February. The project, negotiated by the NIOC and a consortium of France's Total and Malaysia's Petronas, will produce LNG from phase 11.